I am sad to report that Facebook is classifying this post as 'against community standards' and blocking it. No idea what he did, but it worked. I did the 'let us know' step though it has not helped yet. Being in the Milky Way, the only way to get rid of the Galactic Acceleration in the neighborhood of Earth is to find a wide binary where the acceleration of one of the stars is equal and opposite to the Galactic Acceleration. One star at near zero acceleration, the other at 2 * Galactic Acceleration. Maybe look for wide binaries that are 1/4 of a "Milky Way" Revolution in front of or behind Earth would give the best geometry. At near zero acceleration is where your QI model would get interesting. I agree with you there. The point being that both MoND and QI need to correctly factor in the EFE. I agree with you that it should be the vector sum of accelerations. I am led to believe that Mike has been factoring the scalar sum of the accelerations, which makes no sense to me at all. This changes everything when we think about the physics within the cores of these stellar bodies as well. I am sure that the big jump in measured relative velocities is that some of the acceleration is cancelling out with the galactic acceleration, collapsing inertia. It is somewhat related to selection bias, because such an aberrant velocity makes the connectedness as a binary most obvious. 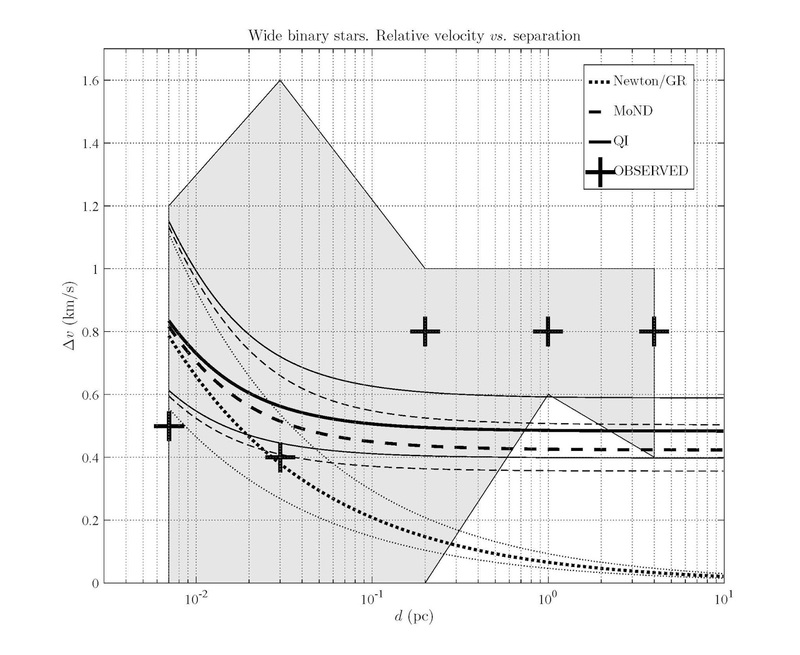 Of the widest binaries, high velocities counter to prevailing rotation around galactic centre outs them as binaries. Glad to see no-parameter theories to explain orbits. Glad to see no-parameter theories that match the data. This is encouraging news. QI is the best theory for a sub-zero (a0) acceleration regime. This needs verification. 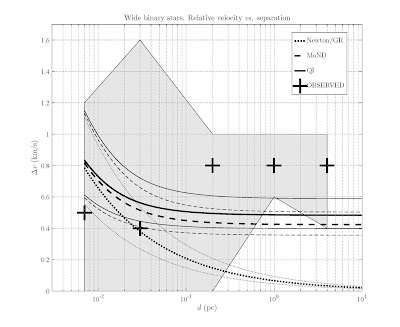 There is far too much uncertainty in the Hubble Width. Once that is refined then QI is basically verifiable right? QI might be a simpler model and a tremendous improvement in our understanding. Why isn't this being done? Someone should adjust some funding somewhere. I can't see how a refinement of this importance is not prioritized. Surely someone is willing to test these ideas experimentally. Plausible tests can be done. Thank you for the very interesting and thought-provoking work! I'd be grateful if you find time to answer the questions below, as I believe the answers may be interesting to many layman readers of the blog. "I'm getting ahead of myself here, but I would like to get rid of waves and particles and express everything as informational 'agents' which see horizons. I can show that horizon dynamics can be derived just from 'agents' interpreting the uncertainty principle in 3d. This is much cleaner than using Unruh radiation (but is just a different interpretation of quantised inertia - same outcome). I haven't published all this yet, but I made a start in my recent paper 'Quantised inertia from relativity and the uncertainty principle'.. "
I was wondering whether you had any progress in the development of this "informational" interpretation of QI? 2) Will you consider accepting patronage via means other than Paypal (before opening the account they ask all possible private information that I'm not eager to disclose to yet another corporation)? For example, Patreon or Stripe? Or maybe even cryptocurrency, such as Bitcoin? I have advised Mike before to look into Frederick Kantor's work in information mechanics to help inform the formulation of a more general, more rigorous model. 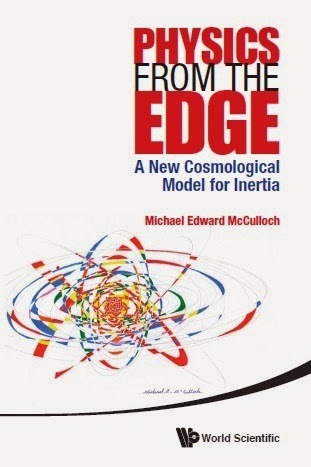 Kantor actually starts his major book out with a trivial example of a single photon in a Universe, with a wavelength of that maximum size, and says that this must inherently represent one bit of information. All you can know about that photon is that it exists, since its position naturally couldn't be defined any more than being in the Universe. So, I suspect the informational treatment of QI must do something very similar, using the horizon as the cutoff. This could have a clean result of linearizing and discretizing the squared scalar that is *energy* into a more robust concept of relative informational content. Analytic_D: I have just ordered Kantor's book from Amazon. Thanks. @Mike: A copy is on its way to me as, well. We can book club it.